mother! is one of those films where it is easy to appreciate the intent without being able to necessarily enjoy it at all. That is to say, while there is much to discuss in the latest from auteur Darren Aronofsky (Requiem for a Dream, The Fountain, Black Swan), there isn't much of it that is enjoyable. That isn't to say every movie-going experience has to be enjoyable as mother! still offers an escape in one form or another, but while Aronofsky is very clearly trying to make a statement here it is difficult to pinpoint what exactly he is trying to say. For further proof as to why mother! is simultaneously admirable and bewildering is the fact it is also one of those films where each scene is a puzzle piece the viewer is supposed to put in place to slowly realize the bigger picture. mother! is deliberately confusing in that it wants you to try and figure out what is going on and what the metaphor is that's at work, but while this coyness may at first seem to be both crafty and a product of Aronofsky's knack for crafting visuals to pair with what are otherwise ephemeral concepts it is by the time the film reaches its third act and things begin to fall into place that mother! is neither surprising nor unsettling enough given this buildup. It is also very easy to see how many people will disagree on this point and either find it wholly fascinating and become enamored with discussing the film or not understand what the writer/director was aiming for and thus dismiss it as a symptom of confusion. While I can't say I fall into either of those extreme categories it is almost more disappointing that I don't as what is most evident after walking out of mother! is that Aronofsky was looking to evoke a reaction from his audience-whether it be fascination or disdain. Rather, mother! is a film that gets points for being something different, for taking on the challenge of making this huge metaphor work for what it is, but that it never transcends the correlation between what is being presented and what they represent so as to bring something new and insightful to the table is disappointing. mother! is a film where nothing seems to quite make sense and everyone around the protagonist seems to know what it going on while the main character and audience surrogate is left in the dark. Because of these kinds of set-ups where the audience is unsure of what is happening and why people are acting the way they are the movie becomes increasingly frustrating to the point the third act really needs to deliver on the purpose of having executed the majority of the film in this fashion, but while mother! could be interpreted as many things one thing it is not, but certainly seems to hope it will be, is groundbreaking. Jennifer Lawrence and Javier Bardem are a married couple in Darren Aranofsky's mother! It is difficult to even talk at a surface-level about mother! without spoiling certain aspects of the plot and so, if you're looking to go in cold to the film (which is definitely the recommended way to see this) then I suggest you stop reading now though you probably shouldn't have read any of this at all. If you've seen any of the trailers or marketing materials for mother! you know that Paramount has largely been positioning the film as a horror movie and this makes sense. In many aspects, that is what Aronofsky is going for and that is seemingly the type of reaction he wants to elicit from his viewer-ones of horror. While his intent may not exactly be to horrify in the sense of scaring his audience he does intend for the viewer to recognize how horrific the picture is that he is painting. There are elements of the film designed to make you jump, others that are meant to provoke a queasy feeling of unease and tension-and having had a child and being a parent myself, there is one sequence that definitely put me over the edge-but overall the film is more akin to that of a dark, you might say very bleak, thriller or mystery. The need to classify the film isn't important though, but brought up only in hopes of establishing better expectations for those that are on the fence about sitting through this. What can be said about mother! 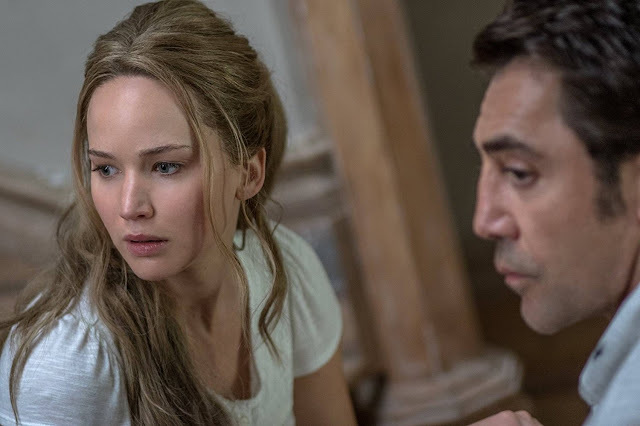 without spoiling too much is that Jennifer Lawrence plays a woman who is married to an older man (Javier Bardem) who is a writer that has seemingly lost any source of inspiration. These characters, who go unnamed throughout the entirety of the movie, live in what is an old family house of Bardem's character that sits in an isolated field and is surrounded by nothing but forest and open fields. While Bardem is constantly finding things to distract him from the fact he is unable to produce and create-unable to find a source of inspiration despite the fact it is only him and his young, beautiful wife in a historic home every hour of every day-Lawrence has taken to re-building their safe haven from the ground up after the house apparently burnt to the ground-taking many of Bardem's character's prized possessions with it. That is, until a strange, rather entitled couple show up in the forms of Ed Harris and Michelle Pfeiffer who are dealing with some health issues and drama concerning their sons (played by brothers Domhnall and Brian Gleeson) that more or less exists to demonstrate a certain theme that is first relayed by Pfieffer's character and then emphasized further and further in a climactic sequence. As more people begin to show up at this once serene setting Lawrence's Mother figure becomes more and more confused and suspicious and angry about what is happening until she becomes so exhausted that there is nothing more to feel. As an audience member it is easy to feel this way too as Aranofksy hits both his main character and his viewers over the head with a heavy-handed finale. That said, the finale is what matters the most in a movie like this, but with mother! Aranofksy's climax feels rushed in terms of both trying to catch the audience up with his intent and making sure we understand exactly what he is going for while simultaneously going to such extremes that it feels as if the metaphor is broken down too much. As in, Aronofsky goes so far to make sure we "get it" that all the mystery and eeriness of what he's been building to kind of dissipates because there aren't too many stones left unturned by the time the credits roll. It's a fine line to walk, admittedly, and for much of the movie we are fed just enough information to piece together what would no doubt be varying interpretations from each viewer, but in wanting to escalate the story in terms of action and raise the stakes for the sake of compelling storytelling it feels as if Aranofsky almost overcompensates which, at this point, why even bother? mother! is so inherently off the beaten path that the only guidelines it seems to follow are those of set-up, confrontation, and Aranofsky's version of a resolution. Otherwise, the film essentially chronicles the inner-emotions of Lawrence's character as she digests all that is taking place around her. Though mother! is something of a maligned attempt at crafting a metaphor it has style and atmosphere in spades. From the first frames of the film there is an unflinching quality to the truth in which Aranofsky hopes to depict everything he sets his camera on through to the introduction of Lawrence where cinematographer Matthew Libatique (Black Swan, Iron Man) captures the actress as if an ethereal being. There is an other-worldly beauty to every frame. There is no debating Aranofsky's technical prowess as he brings the house at the center of this universe to as pulsing a life as any of the flesh and blood characters-capturing the architecture as if it were a human body-much of the film suggesting the house and Lawrence's character are one in the same. Aranofsky isn't one to let a frame go by without packing as much substance into it as possible though, which often times leads the director to hold so tightly on Lawrence's face and particularly, her eyes, that we have no choice but to draw an interpretation from what might be rushing through her mind though there is little dialogue to confirm as much. This only increases the unease one experiences while watching the film as the frame never pulls back far enough to divulge the whole picture, but rather it stays within such a confined space that not only is there confusion as to what is going on, but genuine uncertainty as to what could happen next. Aranofsky, along with composer Jóhann Jóhannsson (Arrival, Sicario), have also chosen to go the non-traditional route in terms of score as they have taken away any musical elements and focused solely on the sound design. Much like the aesthetic does in general, the lack of any music and the intensified presence of the sound design allows no indicator of what might be coming or what the viewer should feel. Aranofsky understands the elements and they come together in mother! to form a rather breathtaking exploration of what Aranofsky was feeling at the time he wrote this, but while it is expertly pieced together it never resonated or knocked me off my feet in a way where the experience will stay with me, haunt me or horrify me. Lawrence's "Mother" is one with the house she is restoring for her and her husband. Now the key question is how, despite Aranofsky's clear knack for exploring psychology and the cycles of life and the role love plays in the validation of our lives, does mother! end up feeling like a hollow shell? Considering it's almost impossible to talk about this film at all without spoiling something what is about to be thought through and written down will most certainly contain major spoilers so, again, you have been warned. mother! Could be about many things-some have looked at it as being an allegory for fame with Lawrence as the perfect model for how our present culture has become obsessed with celebrity and in turn, their need for the attention. Some have linked Aranofsky's parable to that as something deceptively simple as an analysis for the life of an artist, a creator. The idea being that Aranofsky puts into play all the elements many would imagine the most ideal of romances would contain, but that even with everything working to their advantage this kind of love will never be enough for an artist, who will always long for more. Though I'm not a woman and thus likely the reason I didn't necessarily take away the interpretation of the film that reads as an argument for the fact the woman is always the one who gives everything of herself, whom is mined for all she can give, and yet it is still the man who receives the glory and goes down in history. Then, of course, there is the most widespread idea of Lawrence's character representing Mother Earth and in the same vein of the previous interpretation-Bardem's character and all of the unwelcome guests representing that of humanity coming in and mining the planet for all she's worth. As a Christian male raised in the Bible belt of the south though, what spoke to me in mother! was that of Aranofsky's wrestling with how the human race has indeed come to this place of Eden and made it all about themselves-the idea of what is present and real and sustaining our life has taken a backseat to the events we've created and in looking back on our history have attempted to evoke some kind of meaning from them-much as we have done with religious texts. The majority of the film could be played to any one of these ideas, but in the climactic finale it seems evident Aranofsky was intent on taking his audience through the history of our world and all the pain we've brought about on it and for what? One can assign certain roles to certain people with Bardem being this deity, his poem being scripture, and Lawrence's virgin Mary giving all she has only for Bardem to take it and give it all away. mother! displays Lawrence in this role of caretaker and as someone who has crafted a safe haven for those she adores while the guests that continue to swarm the residence bring all we have come up with to occupy our time. The film seemingly reminds us of the superficiality of it all-that once we lose sight of what truly matters we willfully allow chaos to permeate. 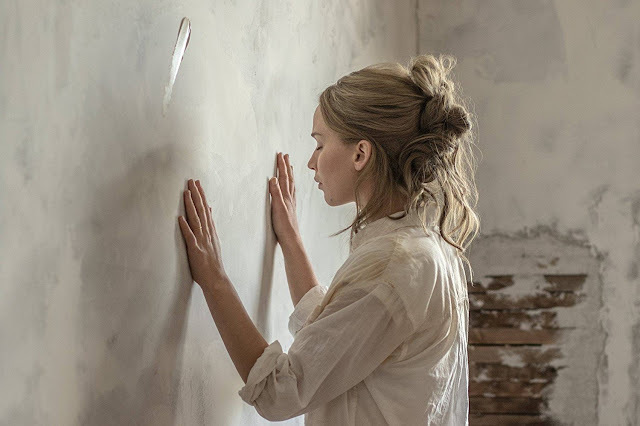 Lawrence and her incarnation of Mother serve as the inspiration for all that comes to be while ultimately serving as little more than the representation of an idea. All of this is admittedly fascinating to contemplate and discuss afterwards, but while the film certainly makes some interesting observations it doesn't seem to have anything equally fascinating to say about them.